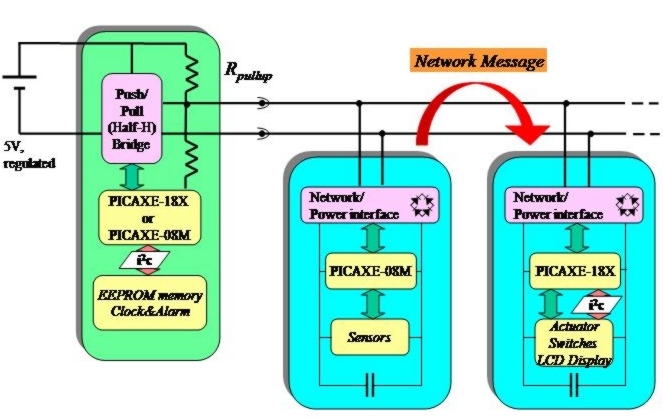 The Picaxe "SerialPower" Network combines power delivery and bi-directional communications between processes on intelligent nodes. This can be implemented using just two interchangeable wires. Simple diode-mixing networks with separate power and communication wires are supported as well. - Networking hardware for linking Picaxe-based nodes. - Picaxe network software that implements communicating processes in a highly automated fashion. A master node (Picaxe 08M/18X) provides for power as well as "timeslots" during which processes on nodes can exchange messages with each other using a standard format. Each process has a unique ID, and each timeslot includes the ID of the process that is allowed to use it for putting its message on the network. The slave nodes are powered from the network and only need a backup capacitor (which may be replaced by a local power source). These nodes can be implemented using any available Picaxe type. The concept of communicating processes is used, allowing abstraction from physical nodes and thereby flexible distribution of functionality over different nodes. A node may implement several processes, and the same process may run concurrently on several nodes with local modifications. Almost all of the network operation and message assembling is done automatically. - The master node is completely application-independent. - Any process on a node can exchange information with any process on another node (including slave-slave comms). Message collissions are avoided by assigning each sending process a separate ID-marked timeslot. - After network power-up (at a user-selectable speed of 4 or 8 MHz), the master node automatically roams the network for processes that may want to send messages, and stores the corresponding process IDs for automatic timeslot generation later on. Furthermore, processes can register or remove timeslots for other processes on the fly as well. - A variant of the network software is also available for simple one-wire "diode-mixing" networks with separate power and serial communication lines. - At 8MHz a maximum throughput of over 20 messages per second (equals 40 bytes of information) can be reached. The network supports both true two networks where both power and serial data is passed on the same interchangeable lines as well as very simple three wire diode-mixing networks with separate power and communication wires. Learn here which network hardware configurations are possible. A separate page is available that describes a number of examples as well as the bare network stacks for both the master and a slave node. All information can be found via the following link: Software examples and network stacks . Application building using SerialPower is easy! Although the networking software is quite large in size, most of it is application-independent and automates the main tasks, like network message construction from user data, message reception and transmitting. Thus rapid application development is supported. You program the basic functionality of one or more processes in the main body loop of a slave node. Furthermore you give your processes a certain ID (byte) and make these IDs known to the network stack at a certain location. Sometimes you may add code to let other processes pass parameters to the slave process. Finally, your process may write data to a dedicated set of memory locations which will be automatically processed into a network message and transmitted. Basically all required network functionality is implemented in a fully automatic way. This includes network speed determination and automatic timeslot registration at start-up by the master node. Incoming network message handling is performed and may lead to user handling routines being called. Furthermore the network stack inspects whether new data needs to be processed into a network message and subsequently sent at the proper timeslot. Finally a number of helper routines are include to allow slave node user processes to synchronize with the network. 1. Read Chapters 1 - 7 of the architecture document (see right pane). 2. Then carefully read the User Guide (Chapter 11). 3. Go to the examples section of this website. Furthermore do a file compare of examples S1 and T2 (WinMerge is an excellent program to do this); this will reveal immediately which part of the slave node software is application dependent and which parts are not. 4. Implement your application on your hardware (do not forget to set the proper slave node configuration for the network type you use). That's all! Further detail and reference can be found in the architecture document. I am also willing to help, but please post your question/issue on the Picaxe Forum SerialPower thread so that others may help and get informed too. The network architecture was originally developed by Jurjen Kranenborg.